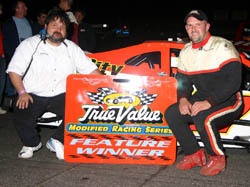 An incident during the SK Modified feature Friday night at Stafford Motor Speedway (CT) has taken on a life of its own. 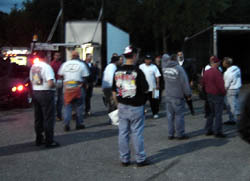 What started out as a little bit of bumping and blocking between Ted Christopher and Frank Ruocco turned into two wrecked race cars, a pit altercation and a one-week suspension for Christopher, who currently leads the SK points at Stafford as well as the NASCAR Dodge Weekly Racing Series divisional standings. Ruocco was behind Christopher for awhile in the feature when the two cars repeatedly made contact. Eventually, both cars spun into the second turn wall together with Ruocco dropping out of the race with suspension problems. The two teams were pitted next to each other and after the race, words flew between the two camps. Ruocco’s crew chief Stash Butova reportedly approached Christopher to show his displeasure with the incident and Christopher allegedly grabbed Butova by the shirt before the incident was broken up. This week, Stafford officials announced a one-week suspension for Christopher for fighting in the pit area. They also cited Christopher for overaggressive driving during his heat race, unsportsmanlike like conduct not maintaining a lane and blocking during the feature. No penalties were levied against Ruocco or any of his crew members. The IBG-PASS Pro Stock Series now has six events and two rainouts in the books and it’s time to get to the nitty-gritty portion of the schedule. This weekend is the first of two long trips north of the border to the Scotia Speedworld in Halifax, Nova Scotia. 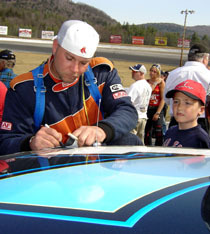 The ride is approximately 600 miles from Oxford Plains Speedway (which is probably considered to be the hub of Pro Stock racing in Northern New England). season will be track regular Dennis Gada, who will be driving the #14 Bear Motorsports Modified. Midgets ruled Seekonk Speedway (MA) last weekend. The track hosted both the NEMA Midgets and the USAC Northeastern Ford Focus Midget Series. Waterford is a natural place for Pasteryak to drive. He is a regular competitor in the SK Modified division and the track and finished second in last week’s 150-lap Budweiser Nationals race there. The young driver will replace his feather in the family car for this event. Hirschman was hoping to actually make his Mod Tour debut two weeks ago at Thompson International Speedway (CT), but the event was rained out. He plans to run a limited schedule of Tour races in addition to his full slate of Race of Champions Modified competition this season. Already in the season, several teams that were thought to possible be planning full-time, or nearly full-time, assaults on PASS have fallen by the wayside. Tracy Gordon, Rick Martin and Garry Johnson have also run selected events only. Two drivers who were full-time competitors, GeGe Gravel and Walt Hammond, skipped Unity. With such a long haul coming this weekend, you might expect a few more teams to skip a race or two, but an informal poll of the pit area at Unity showed that all of the full-time PASS teams plan on trying to make the trip. “We’ve got the car in one piece, so we’ll be going to Canada,” said Corey Williams. The Forbes Chevrolet-Oldsmobile 200 takes place on Saturday night at Scotia Speedworld. A pair of NASCAR Whelen Modified Tour drivers will see their sons follow in their footsteps this weekend at the Waterford Speedbowl. Tony Hirschman’s son Matt will look to make his Tour debut along with Chris Pasteryak, who will drive his father Charlie’s # 5 car. Ben Seitz started deep in the pack in the 25-lap NEMA feature, but that didn’t matter too much. The young driver has dominated the series as of late and put his #17 into the lead on lap 8. He beat Randy Cabral, and Mike Keeler for the victory. USAC driver Bobby Santos, III made a rare return to his roots in NEMA by dropping in to wheel the #2 car since its regular driver Chris Perley had a ISMA Supermodified event to race at. Santos made the most of his appearance at Seekonk by finishing fourth. In the Focus midgets, the night belonged to teenager Brit Anderson, a graduate of the Seekonk Young Racing Association ranks. Anderson won his heat race and started eighth in the feature. 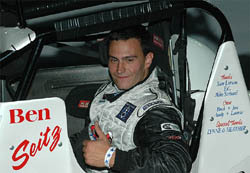 With 18 circuits of the quarter-mile bullring, he was back in the lead again and held on to stay in front of Stephanie Stevens, Michael Sboro, Jeff Abold and Dana Messier at the finish. 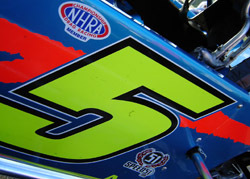 NEMA will take to the track again on The Focus midgets next visit Oswego Speedway (NY) on July 9th. Last week we told you that PASS car owner Steve Webster was critically injured in an industrial accident. This week, there is much better news for his family, friends and team members. Webster, owner of Bobby Cabral’s PASS cars, is still in a Massachusetts hospital, but has been moved from ICU and into his own room. He talked with team members this week and even asked if they were all set to go racing. Webster faces a long rehabilitation period from his injuries, but is said to be in good spirits. Oxford Plains Speedway (ME) is going to be a busy place this summer. Assuming that there will be no rainy weather (a big assumption this season in New England), the track will be hosting races on 17 of 31 evenings this July. The track, along with nearby Beech Ridge Motor Speedway, was a victim of the weather this past weekend. Both tracks will be in action against this weekend and Oxford has rescheduled their program from last week to a special Thursday night show on July 14th. there was contact and he ended up parking his car at the start finish line. The car was removed with a wrecker and Alexander was disqualified from the event. Alexander’s scorecard for 2005 now shows four victories and two DQs in six events. The NASCAR Busch North Series and Whelen Modified Tour doubleheader that was rained out two weeks ago has been rescheduled for October 8th.